Yuya Sakaki, also known as Phantom, is the primary protagonist in the Yu-Gi-Oh! ARC-V manga. He is a mysterious Entertainment Duelist whose goal is to find the "Genesis Omega Dragon" card - a card that, according to him, will decide the future of this world. Yuya shares his body with Yuto, Yugo and Yuri due to currently unknown circumstances. However, Yuya can take over their body as he sees fit. He is currently being hunted by the Leo Corporation and is wanted for hacking the Solid Vision with Mass system in order to look for "Genesis Omega Dragon". Reiji Akaba calls him the "Factor of Destiny". Yuya's physical appearance is similar to his anime counterpart: Being a young teenage boy with crimson eyes, and dual-colored green and crimson hair of average length sticking out in downwards pointing spikes all around his head. He wears a simple red T-shirt with a thick, silver-buckled brown belt, green pants, magenta shoes, and crimson wristbands. He also wears a pair of golden goggles with orange lenses on his forehead, with a blue star obscuring the right lens, a buckled choker, and a good-luck charm pendant. He also wears a long gold and red lined white school jacket with hood over his shoulders like a cape, which is the only form of clothing of Yuya's that remains present whenever his counterparts use their body. During his Turbo Duel against Ren, Yuya wears a predominantly red jumpsuit with a secondary white trim and orange markings, and with padded knees. The chest of his jumpsuit is grey. Yuya wears a jacket with the same color scheme as his jumpsuit that flares out above the hips, and black-backed white gloves. He wears his googles over his visorless helmet. Like his anime counterpart, though he can sarcastic at times, Yuya is a fun-loving and energetic youth who believes that Dueling is meant to make others happy and enjoys entertaining opponents and spectators alike. While he can be reckless at times, Yuya proves himself to be quite clever and skilled in Action Duels along with escape and sleight of hand techniques. Yuya is also usually friendly to other people, even to a duelist like Shun Kurosaki who follows an opposing Duelist ideology. While Yuya did express anger over Sora Shiunin intentionally harming others with Pendulum Monsters, he managed orchestrate a roundabout to win the duel without hurting the boy. Yuto meets a crying boy. Yuya is a Dueltainer from twenty years in the future, unable to remember the full story save that his father Yusho Sakaki sent him back in time to find the Duel Monsters card Genesis Omega Dragon. With his three alternative personalities, Yuya began searching for six months before hacking into the Leo Corporation's mainframe for any clue about the G.O.D. card. While it bore no fruit, Yuya hacked the Solid Vision to help various people out before escaping the authorities under the alias "Phantom". Though Yuto took over their body so they can keep a low profile, the sight of a sad boy provokes Yuya to cheer him up with his "Odd-Eyes Phantom Dragon". Yuya's good deed attracts Leo Corp as consequence, forcing Yuto to make an attempt to misdirect the leading agent Shingo Sawatari who was escaping to find Yuya.. But Yuto's attempt back fires when Reiji Akiba gives his subordinate orders to capture Yuto as Yuya's accomplice. When Yuto got pushed into a corner, Yuya convinces his counterpart to let him deal with Shingo as the latter and everyone witness Yuto turning into Yuya. With only 200 life points, Yuya quickly sets the Pendulum Summons "Odd-Eyes Phantom Dragon" and uses his Solid Vision pigeon Poppo to retrieve an Action Card that enables him to win the duel while eluding his pursuers as Shingo was dueling a hologram while the real Yuya was at a nearby building. It was then that Yuya encounters Yuzu Hiragi, thinking she was a fan wanting his autograph before she nearly got them killed when she stowed aboard the giant paper plane he materialized. Yuya manages to save Yuzu from drowning and brings her to the abandoned water treatment plant that he made into his base of operations. There, Yuya learns that the "autograph" Yuzu had him sign was actually a legally-binding teaching contract for Syu Zo Duel School. After a comedic banter between the two over the manner of Yuzu's managerial payment, Yuya reluctantly accepts her help on his mission. However, telling Yuto it is not his fault, Yuya later learned his involvement with Yuzu resulted in the abduction of her father by Shun Kurosaki who calls out Yuya out of a personal vendetta based on their conflicting ideals. Yuya accepts and duels Shun, ignoring Yuto's attempts to advise him on how to deal with a duelist who has most likely analyzed their moves. Though Yuya gets by dwindling Shun's lifepoints to 100, he gets unnerved by Shun's expression of joy from feeling such pain while summoning his "Raidraptor - Blade Burner Falcon" to turn the tables. But while Yuya gets to Shun by admitting the feeling he gets from Dueltaining is same as Shun's rushing feeling from his dueling style, he sees Shun to not be completely bad as he saved Yuzu and her father. After beating Shun, Yuya saves him from falling to his death while leaving an impression on his beaten opponent. When the Hiiragis then make an attempted promotion with Yuya, he gets embarrassed, and teleports them back to their school using his tricks. Back at Syuzo Duel School, caught in the middle of talking to Yuto by the Hiiragis, Yuya reveals that that he has two other personalities besides himself and Yuto. This causes Yuya to note that neither Yugo nor Yuri have been making themselves known with Yuto covering up their actions by making Yuya think that are having a road trip in his mind. Yuya explains to tell Yuzu what he can remember and the threat that Genesis Omega Dragon poses to the world if it ends up in the wrong hands, telling her he has no time to promote her school. But Yuzu, seeing Yuya's mission would profoundly effect her father's school, insists on moving in with her as her manager. The next day, Yuya's computer alerts him to leaked intel on the G.O.D. card from the Physical Information Systems building, going that with Yuzu on the possibility that the card is there. Yuya lets Yugo use their body to infiltrate the building with Yuzu, only to take over when end up entering a trap set up by Sora Shiunin. After a brief batner, Yuya and Sora proceed to duel with the former having the advantage until he noticed a photo of Sora and his little sister. Sora proceeds to instill conflicted feelings in Yuya to capitalize until Yuri takes over. Yuri proceeds to torture Sora into confessing that he was playing Yuya, with Sora admitting it once he manages to overpower his opponent while revealing to have tripled the amount of pain the duel field produces. Yuya, feeling the immense pain Yuri endured, regains control of his body and refuses to let Sora continue harming others with his prototype Pendulum Monsters. Yuya accomplishes this by beating Sora in a way that dwindles his life points without dealing harm to the child. But Sora realized the roundabout strategy and retaliates by overloading the Solid Vision at the cost of his well being. After shielding himself and Yuzu from the resulting explosion with his jacket, Yuya loses conscious from the pain with Yugo taking over to bring him and Yuzu back to their hideout. When Yuya comes to one his couch, he is informed by Yuto and Yuri of what occurred while he was out: That Yugo dealt with a masked Turbo Duelist named Ren who is apparently of a third faction that knows where they came from and entered Yuya's mind to find something called the Adam Factor. As Yuzu returns from grocery shopping, Yuya is alerted that Reiji has found his hideout and enters it. Yuya expects not to be walking away from dueling Reiji, telling Yuzu to sell his stuff if he does not come back while triggering a trapdoor that sends him and Reiji to an underground cave under the water treatment plant. With Reiji noting the nearby escape pod which brought Yuya to the present, Yuya attempts to reason with him that they don't need to fight. But Reiji insists out of fate and blaming Yuya's father for causing the death of his father Leo Akaba. Reiji also insists on a normal duel when Yuya was about to set up an Action Duel, Yuya accepting it while still intent to entertain his opponent. After Yuya Pendulum Summoned three Performapal Card Gardnas to bolster his defense, Reiji expresses some gratitude towards Yuya for ensuring they would be able to privately discuss matters of their home in the future. Reiji proceeds to reveal how their fathers' development of Pendulum Summoning and Solid Vision with Mass led to them discovering the G.O.D card. As Reiji uses his Pendulum Monsters' effects to destroy Yuya's monsters and prevent him from Pendulum Summoning, he explains that Yusho's stealing the G.O.D card doomed their world and intends to ensure Yuya never obtains it. Forced to have Yuto and Yuri back him up with their dragons after asking them to let him handle Reiji, Yuya attempts to explain his father's reasons of stealing the G.O.D card. But Reiji refuses to listen until Yuya can defeat him and his "D/D/D Destiny King Zero Laplace". After placing his counterparts' dragons on his Pendulum Scale, Yuya uses Overscale Pendulum to summon "Odd-Eyes Phantasma Dragon" to turn the tables. But the youths' duel is postponed when Reiji reveals they are being watched by a camera sphere, with Yuya encountering Ren when he appears. Ren reveals that the G.O.D. card in in the possession of his leader Eve and that they need the Adam Factor which both Yuya and Reiji possess to unlock Genesis Omega Dragon's full power. But the damage caused by the duel causes a cave-in, forcing all parties to escape. Once safe, Yuya attempts to convince Reiji that they need to join forces against the new threat Eve poses. 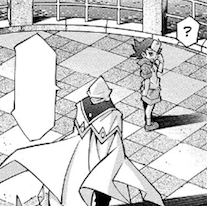 But Reiji refuses and leaves, Yuya feeling that Reiji may reconsider once he accepts the truth of what he said to him. Soon after going off the grid, Yuya spends the next two weeks being trained by his counterparts in a waterway before they were found by Yuzu while Yuya was in the middle of learning to maneuver a Duel Runner under Yugo's harsh guidance. Soon after, he and Yugo collaborating a plan to take their pursuer out, Yuya calls Ren for a Turbo Duel before being subjugated by Yugo and ending up inside his mind where he cannot see the match unfold. But Yuya, while wandering around within his mindscape, finds the network of roots containing his memories before being forced back into his body to continue the duel in Yugo's place. But as Yuya tries to find out how to defeat Ren's White Aura Biphamet, the resemblance catching him off guard, he is shocked to learn Ren is a descendant of Yugo from the distant future. Once Yuya gets the edge, he learns White Aura Biphamet's weakness and completely destroys it. Following Ren's defeat as he was forced to fall back before his body completely dissolved, Yuya learned the full nature of the Adam Factor while Ren mused if Yuya's will is strong enough to resist the G.O.D. card's manipulation. Seeing Yuzu utterly confused by the series of revelations Ren revealed, and learning of his concealed memories, Yuya assures her that they will make sense of it all before they find themselves watching Reiji's duel against Isaac via cable feed from Reiji's space station. 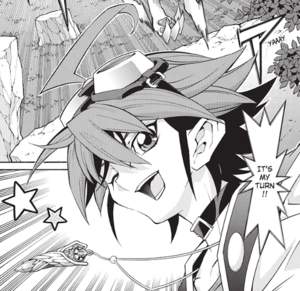 Yuya in the special manga chapter. Yuya is shown facing Reiji Akaba in an Action Duel in the special manga chapter. He is 14 years old and aims to be a Pro Duelist. Yuya uses the same strategies as his anime counterpart, using his "Entermate" monsters to explore the field, like riding on "Entermate Silver Claw", for example. He is also able to perform Pendulum Summons in the manga, although how he got his Pendulum Monsters is not explained. 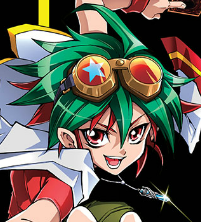 Yuya keeps his anime counterpart's opinion regarding Action Duels: he believes that Duels are entertainment, and should be "happy, fun and silly". This section may require cleanup to meet this wiki's standards. You can help out by re-organizing or re-writing parts of it or checking grammar and spelling. Yusho is Yuya's father. Yuya loves and admires his father immensely, taking the mission that father ensured himself seriously. Yuya even defended Yusho when Reiji expressed his distain towards the man. Yuzu is the first person Yuya met since arriving to her timeline who was not with Leo Corp and became one of Yuya's closest friends despite tricking him into signing a teaching contract at her father's school. But after terms of payment as Yuya's manager, Yuzu offered to help him in his search for the G.O.D. card before learning as much of the significance as Yuya remembered. Yuzu is overall supportive of Yuya and his counterparts, having originally assumed "Yuto" as some sort of comedy act. Yuya and Yuto's differing personalities and stark experiences, combined with their similar ideals, make them each other's foils. Their history prior to sharing a body is unknown at the time save the two knew each other. At times, acting like the big brother to his counterparts, Yuto would tend to scold Yuya whenever he does something that puts them at risk like cheering up a kid while they are being hunted down by Leo Corp agents. Prior to sharing a body, Yuya and Yugo were good friends with the former supporting him during his turbo duels. Following that events that have him currently inside Yuya's mind, Yugo reluctantly acts to suppress Yuya's memory alongside their counterparts to spare him from what they know. During such an influx of memories he manages to deal with, Yugo expressed that he could not forgive a certain person who appears to be the reason he and the others sealed Yuya's memories of them as separate beings. It is also because of their close ties that, which the two abruptly switched places in their duel against Ren, Yuya was able to predict Yugo's strategy and execute it in his place. Yuya and Yuri are complete opposites of one another: while Yuya sees the good in others and duels for fun, Yuri sees only the worst and duels in a sadistic manner. Yuri even forcefully took over Yuya's body during their duel with Sora, scolding Yuya for his gullibility while torturing Sora to expose him for the deceptive sadist he is. Their history prior to sharing a body is unknown at the time save that Yuri genuinely cares for Yuya to the point that he will show no mercy to anyone who harms Yuya in any way. Learning they are from the future, having expected to face him sooner or later, Yuya learned how their home was destroyed by Genesis Omega Dragon from Reiji's perspective as he blamed Yusho for it. Yuya made attempts to convince Reiji that his father is not to blame during their first duel, but Reiji refused to listen as both of them are revealed to possess the Adam Factor which is sought by the mysterious Eve. Yuya first met Shingo during Yuto's duel against the pursuing Leo Corp duelist, taking over for his counterpart to finish the duel. Following Yuya defeating him, Shingo considered him a rival. Yuya first met Shun when he kidnapped Yuzu's father to forced the youth to duel him, Shun considering Yuya's dueling style an insult due to his background as a duelist combatant. During the duel, Yuya admired Shun's code of honor when he paused their duel to save Yuzu and her father from certain death. Yuya returned the favor when Shun almost fell to his death, with Shun coming to respect Yuya as a duelist and sees him as a worthy rival. Sora has shown great interest towards Yuya, deciding to duel him on Reiji's suggestion for the answers he seeks concerning Reiji's own agenda. When their duel began, having increased the pain receivers in their arena, Sora attempted to catch Yuya off guard by claiming he is being forced to duel because Reiji holds his sister Miu hostage. But Yuri takes over Yuya's body and shows him that Sora is nothing but a lying sadist, with Yuya allowed to finish the duel and beat Sora in a way that does not force him to sink to the child's moral level. Unlike similar characters (e.g. Yugi Muto, Yuma Tsukumo), Yuya uses a completely different Deck from his partner(s). If any of his counterparts takes over Yuya's body during a Duel, the contents of their Deck will change along with their persona. Furthermore, at the same rate as Yuya influences his counterparts' Decks (such as evolving Yugo's "Clearwing Fast Dragon" into a Pendulum Monster), Yuya's Deck appears to be influenced by his counterparts as well, with Yuya using "Mirage", "Persona" and "Phantom" monsters when Dueling alongside Yuto, or using "Rose" and "Handsome" monsters when Dueling alongside Yuri. 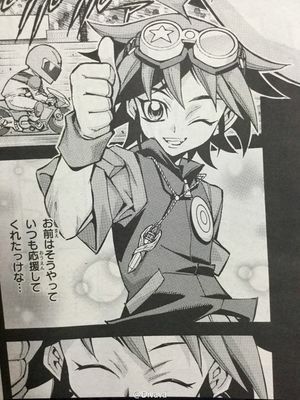 In the special manga chapter, Yuya runs an "Entermate" Deck, like in the anime. ↑ Originally, the Performapal monsters were referred in the official English version of the manga by their Japanese name "Enter-Mate". However, in Scale 15 and the release of the English version of the first volume, the archetype was referred as "Performapal". ↑ Yu-Gi-Oh! ARC-V Scale 3: "Pendulum Summons!" ↑ Yu-Gi-Oh! ARC-V Scale 7: "Genesis Omega Dragon!" ↑ Yu-Gi-Oh! ARC-V Scale 8: "Sora's Hospitality!" ↑ Yu-Gi-Oh! ARC-V Scale 9: "Fusion vs. Fusion"
↑ Yu-Gi-Oh! ARC-V Scale 15: "It's Zero!" ↑ Yu-Gi-Oh! ARC-V Scale 20: "Your Opponent Is Me!" ↑ Yu-Gi-Oh! ARC-V Scale 23: "The Trick Revealed!" ↑ Yu-Gi-Oh! ARC-V "Special One-Shot"